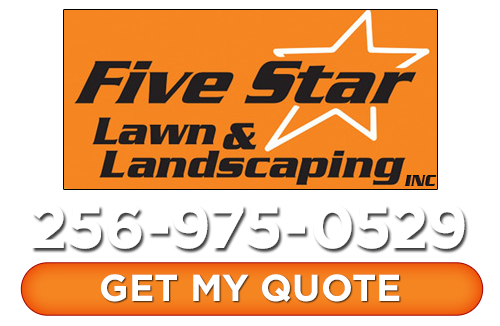 When it comes to professional Huntsville landscapers, Five Star Lawn and Landscaping, Inc. is the name to count on. We have been building up our impeccable reputation since even before launching the Five Star Lawn and Landscaping, Inc. name in 2008. But since then, we have worked hard to let our commitment to hard work and exceptional customer care build up our impeccable reputation. The bottom line is that whatever type of service it is you need done, in relation to landscaping and lawn care, we can take care of for you. We even take care of jobs like seasonal services, outdoor lighting and outdoor kitchens and living spaces. So if you are ready to find out firsthand how we got to be the top choice for a Huntsville landscaping company, give us a call today. If you are looking for a Huntsville landscaping company then please call 256-975-0529 or complete our online request form.